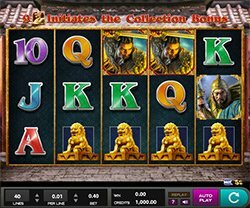 Red Cliffs slot by IGT and H5G is inspired by one of the Four Great Classical Novels of China. During the period between the Han dynasty and the Jin dynasty there arose three kingdoms, which aimed to unify and control China. High 5 Games has adapted this story for the casino audience through the artistic portrayal of the leaders and their fierce competition for power. The Red Cliffs slot game has 40-paylines across it’s traditional 5-reel interface with slot reels set within an ancient Chinese temple. The sounds are nothing remarkable, sounding just like many other IGT slots. It is a familiar sound however and although they aren’t exciting, the real excitement lies within the slot’s graphics, math and features. On the reels you’ll find gold and emerald dragons, three different Chinese warriors and card symbols ten through ace. Collection Bonus & Free Games – Getting 9 ivory dragon symbols in all positions on reels 2, 3 and 4 initiates the Collection bonus and will earn you 7 Free games. During the free games you can collect 5 different Scatter Symbols which respectively appear on reels 1 to 5. These are the Water Holder, the Sun Dial, the armor, the scroll and the vase. If you collect all 5 of the symbols during your free games, another set of 7 free games will be awarded. You can trigger up to 28 free games however, should you collect all the symbols in your final set of 7 free games, you will have the total number of credits won multiplied 10x. Super Stacks – During your free games you may also benefit from the Super Stacks Feature, and all stacked symbols can be transformed into one symbol to give you the chance of multiple wins. The symbol that the stacked symbols will change to is revealed by picking a Golden Dragon.